Every company goes through a process of discovering their image and branding as they get their feet under them. For Strawberry Moon, it was a pretty short process: the idea to sell vintage books online came to me and a few weeks later, I was open for business, believe it or not! One of the branding decisions that were most important to me right at the very start was choosing the fonts for my business name, as I had decided against any kind of a graphic logo. The fonts needed to be punchy and memorable but still easy to read. 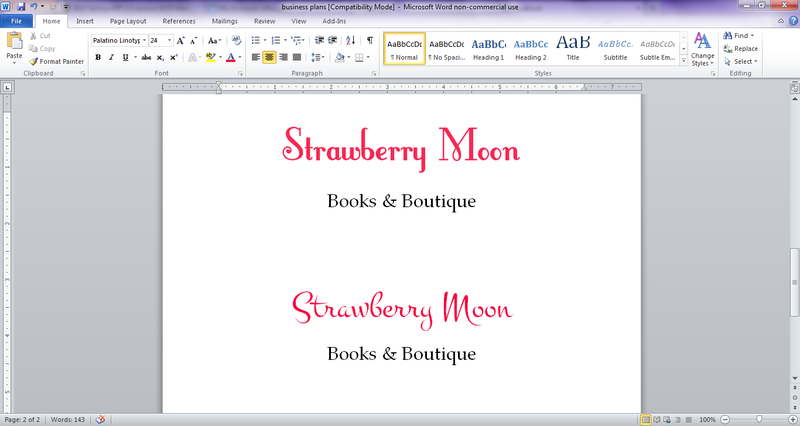 I settled pretty quickly on Palatino Linotype for the ‘Books & Boutique’ portion but was determined to find the perfect font for ‘Strawberry Moon.’ So as every girl does when faced with the dilemma of choosing between two options, I sent off a Facebook message to my best friend, which included this screencap of the Word document I was experimenting with that day. She picked the top one and Fontleroy Brown has been the Strawberry Moon Books & Boutique font ever since! You’ll find it in the blog header, Etsy shop header and on various branded graphics, including the Friday Faves banners. You can find the Fontleroy Brown font here!